From the creator of the wildly popular cooking and healthy lifestyle website DashingDish.com, comes a clean eating cookbook designed to give home cooks a healthy start to 2015. Dashing Dish: 100 Simple and Delicious Recipes for Clean Eating (Nelson Books) by Katie Farrell combines delicious and simple recipes with easy tips for incorporating clean eating habits for a healthier lifestyle. As a registered nurse, Farrell has spent years teaching others about nutrition, health and overall wellbeing. Since its inception, her hit website DashingDish.com has garnered more than 25,000 monthly subscribers who access her recipes, cooking videos and fitness plans. 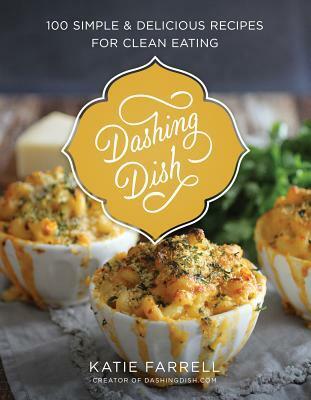 For readers new to clean eating, Dashing Dish makes it easy to transition by providing lists of valuable pantry, fridge and freezer items helpful for maintaining a healthy lifestyle. The book also includes important conversion charts and offers clean substitutes for some popular unhealthy foods, making the jump to clean eating as simple as possible. I love food. I also love the cover of this cookbook! I am always open to new ideas for meals. There are so many things you can do, I'm just not always that creative and need others to show me what to do! This book is all about clean eating. So there are a few recipes that call for protein powder ( though she does list a substitution at times). To me this also seemed like a great cookbook for a home of one or two people. There are many recipes that are "cake for one" or "dessert for one". I like this idea because then you don't end up making a bunch of goodies and eat it all. This way she shows you how to make a smaller amount that is much better for you. The pictures are great and for each recipe. I think that is pretty important this day in age and I like to see what I am making. The only thing I didn't like so much is the use of so much Stevia, which I really don't like myself. I also discovered that many of these recipes were nothing new to me. I did find some great recipes though! The book is split up into sections after the intro and clean eating topics: Breakfast Lunch, Dinner, Side Dishes, Snacks, and Desserts. My favorites are The Best Giant Frittata, Peanut Butter Breakfast Bars, Lightened Up Salmon Cakes, and Slow Cooker Sweet and Sour Chicken. So that shows you the variety and that seems to be in each section. The organization of the book is wonderful and overall this is a good cookbook. If you are clean eating and trying to come up with new ideas, perhaps you should check this cookbook out! "I received this book from Icon Media Group for free in exchange for an honest review."